No more messy boxes of holiday wrapping paper with the Honey-Can-Do Canvas Gift Wrap Organizer, you have room for 12 of your favourite standard wrapping paper rolls as well as divided compartments for scissors, bows, tags and accessories. The top also features a clear vinyl interior compartment for additional storage. Designed to protect contents from moisture and crushing, the interior includes a divider that creates a 10-inch by 10-inch compartment to keep wrapping essentials from intermixing when held upright. The fully zippered closure ensures contents stay put during transport, while a water-resistant inside coating keeps moisture at bay. Exterior handles and a slim shape ensure easy portability, and the stackable design helps conserve space when storing. The Husky Click It Bin #4 Gray Plastic Small Parts Storage Bin features a large catch-all compartment to help you store and organize small parts and accessories. A writable/erasable area allows you to label the bin's contents for easy identification. The bin can be stacked with other bins (sold separately), for convenient storage. 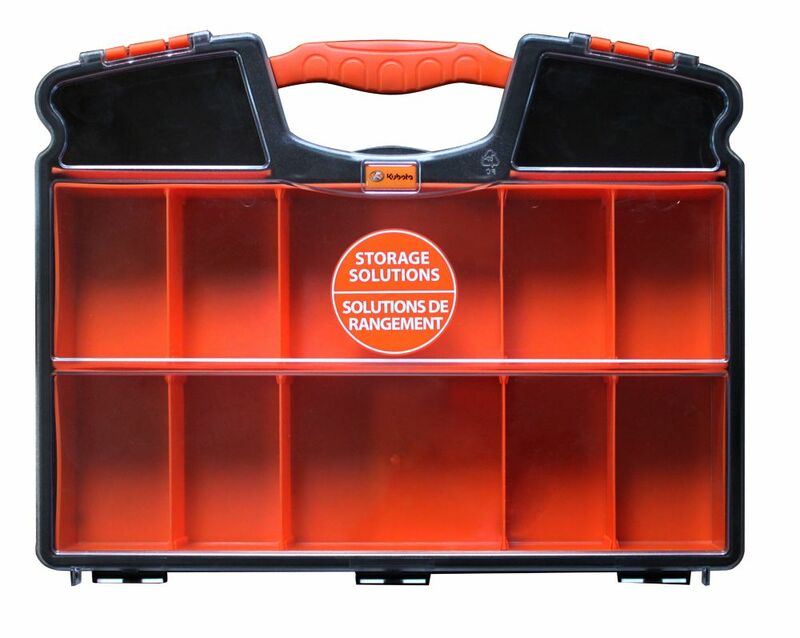 2 Pack 12 Compartment Organizer The Kubota 2 Pack 12 Compartment Organizer has removable dividers that lets you organize small or large parts and accessories Unbreakable impact resistant lid. Unique lid design locks all compartments in place.